The next Mass Effect 3 DLC pack has been inadvertently revealed. 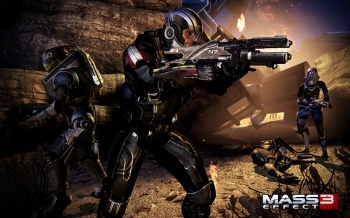 Like the flash of a shooting star, it was there and then gone: "It" being the latest multiplayer DLC release for Mass Effect 3, which appeared briefly on Sony's Hong Kong website and then disappeared into the ether. It's not the promised clarification to the end of the single-player game, however, but a new multiplayer expansion pack called Rebellion. The Rebellion expansion will add two new multiplayer levels, the jungle-based Firebase Jade and Firebase Goddess on the Asari homeworld of Thessia. Also in the mix are three new weapons, new equipment and consumables and six new classes: the Quarian Engineer and Infiltrator, Phoenix Adept and Vanguard, and my favorites of the bunch, the Vorcha Soldier and Sentinel. Vorcha! And what is this "Phoenix" business? Nobody knows for sure but based on conversation on the BioWare forums, the smart money appears to be on Protheans. Perhaps Javik isn't as alone as he thought? When this will happen is anyone's guess too, although "soon" is probably a good bet; before it was pulled, the Sony site said the new content would be released today.